Today we are looking at a very special herb that can take care of your heart, cleanse the liver and maybe even prevent cancer and diabetes. I am talking about barberry root – an extremely health herb that you can take in extract form or use to make a healthy tea. If you would like to find out more about this herb, how to use it and exactly how it might benefit your health, read on. Barberry is one of nearly 500 species of deciduous shrubs and thorny bushes in the genus – berberis belonging to the Berberidaceae family of plants. Barberry bushes can be found in many parts of the world and are common in North Africa, Europe, Central Asia and the Middle East. Barberry is often known as berberis, European barberry and trailing mahonia. Many parts of the bush are used to make medicine including the roots, bark and the berries. The fruit itself is very sharp but edible and contains a variety of nutrients and is especially high in vitamin C.
Barberry has a long history of medicinal use. The ancient Egyptians were using the herb thousands of years ago to ward off disease and plague. It has also been used in India to treat dysentary while more recently, the Native Americans passed on its uses to the settlers. In Europe, barberry has been used by herbal practitioners to treat a range of illnesses including liver problems, gallbladder complaints, inflammation and hypertension. Barberry root as well as the stem, bark and fruit all contain beneficial alkaloids most notably – berberine. Studies done in the laboratory and on animals have demonstrated that berberine has various medicinal properties including antimicrobial, anticonvulsant, anti-inflammatory, sedative and hypotensive actions. Studies also indicate that berberine can have a beneficial effect on a person’s immune system which makes the herb useful for a broad range of illnesses. As well as berberine, barberry is an excellent source of antioxidant vitamin C and thiamine. It also contains carotenoids including lutein, beta-carotene and zeaxanthin and minerals like zinc and chromium. The reason that barberry has proven so effective over such a long period is largely because of its berberine content. 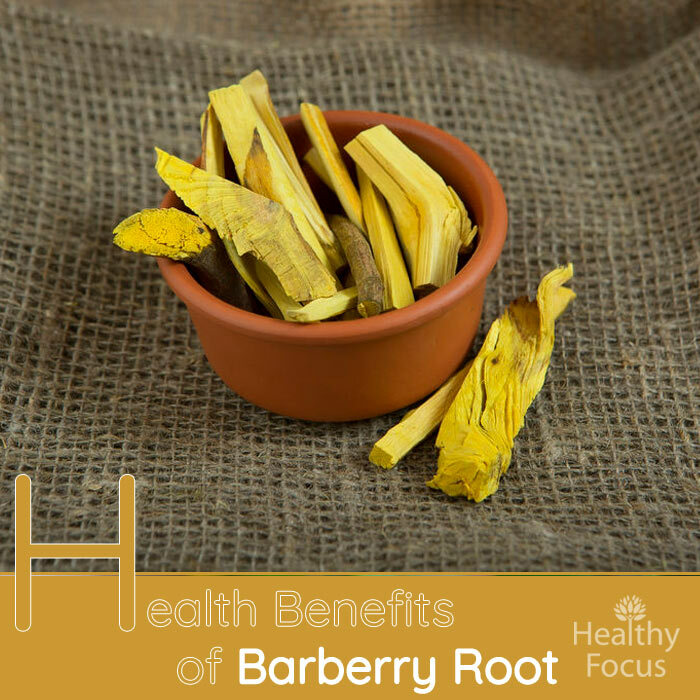 Barberry root is used for similar purposes to goldenseal because they have berberine in common. A number of studies have looked at the medicinal value of berberine and found that it can stimulate immune health, inhibit bacterial growth and relieve inflammation to name just some of its abilities. Barberry root and tea can also be used to treat a range of common stomach conditions. Berberine acts on those smooth muscles lining the intestinal wall and improves general digestion and relieves gastric pain and inflammation. Barberry is a good natural remedy for stomach bugs and bouts of diarrhea. Another major benefit of barberry root is its impact on blood sugar levels which makes it a great choice for people with diabetes and those at risk of the disease. In one study, the berberine present in barberry was compared to a common prescription drug for diabetics called metformin. The researchers found that 500mg a day of berberine taken twice or three times a day for three months was just as effective as the prescription medicine. Barberry root can also help to combat metabolic syndrome – a disorder involving a combination of high blood pressure, abdominal obesity, high blood pressure and high cholesterol levels. An Iranian study published in 2014 looked at the impact of barberry extract in patients diagnosed with metabolic syndrome. 106 patients were split into 2 groups and either given barberry extract or a placebo for a six week trial. The researchers noticed significant improvements in those taking the barberry compared to the placebo group. The role of berberine in bile secretion is important since cholesterol and waste products get excreted almost entirely via bile secretion. By improving your secretion of bile, barberry root can improve liver and gallbladder health resulting in better overall health. Barberry root and barberry are available in several different forms including capsules and tinctures. You can use dried barberry root to make a healthy tea. Standardized extracts contain between 8 and 12 percent berberine. When taken at the recommended dose, barberry root does not cause any serious side effects in healthy people. In very high doses, certain side effects are possible including vomiting and nosebleeds.It is not recommended for young children as it may interfere with proper liver function in infants. Pregnant women should avoid taking barberry because it could stimulate uterine contractions and miscarriage. Nursing mothers should avoid barberry and barberry root.